In the world of science and mathematics, there are laws and absolutes. Two plus two is always going to equal four, no matter how much you might wish otherwise (yes, those two cookies and two donuts really do equal three more treats than you intended to consume), and you can count on the sun rising each morning from the east. In the more creative worlds of fashion and interior decorating, however, while there are certain guidelines that can help you create an outfit or a home that looks great, there are actually no laws you must follow. In fact, you can pretty much decorate whatever way you like best without fear of any “decorating police” showing up at your doorstep, ticket book in hand. Still, many people are hesitant to attempt decorating their own homes because they fear they don't know the "rules" well enough to avoid making a mistake. But never fear—if you are getting ready to redecorate your bedroom, set these common myths aside. Yes, it’s true that buying a complete set of matched furniture is easy and safe, and sometimes, it can even be a bargain. It’s also true that many beautiful bedrooms are furnished with bedroom sets, especially when the style is formal or traditional. The problem with relying on a furniture manufacturer’s taste for your own décor, however, is that you lose out on individuality, and often, interest. Feel free to mix and match furniture as you like. As long as you maintain balance and choose pieces that complement each other in some way, you’ll end up with a creatively eclectic space, not a mess. Yes, you are likeliest to buy a complete sheet set (fitted and flat sheet, along with pillowcases) but there’s really no reason you have to, other than convenience. Instead, have some fun mixing and matching colors and patterns. One of the easiest ways to do this is to buy extra pillowcases in various patterns or colors that contrast—and complement—your flat and fitted sheets. Since you should change your pillowcases every couple of days, but probably only change your sheets on a weekly or biweekly basis, it’s always a good idea to have extras anyway. If you prefer to stick with sheet sets, then buy two or three that complement each other—but aren't the same—and mix up the components when making your bed. It seems like common sense; use a light wall color in a room that doesn’t get much natural light. But actually, white and other light colors often take on dingy overtones when the light is dim. Instead, feel free to indulge your inner yearning for a strong, saturated wall color. Forest green, navy blue, charcoal gray, chocolate brown….pick your favorite hue and see how your dark bedroom is transformed into a rich, welcoming, elegant space. It’s true that the large, horizontal surface of a mattress cries out for the balance of a vertical anchor, but that anchor doesn’t have to be a traditional headboard. In fact, headboards are the easiest piece of furniture to substitute with something more creative, decorative or just plain fun. 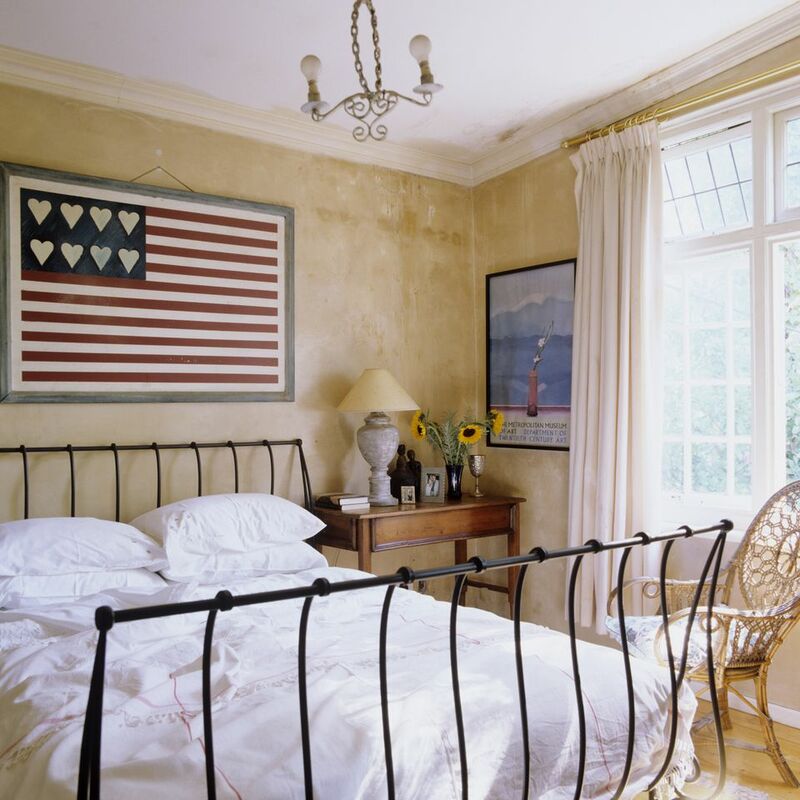 Try hanging a quilt or a tapestry in the space, or paint a headboard right onto the wall, or use an antique door or set a folding screen at the head of the bed. The only limit is your imagination, really. As for a footboard, many styles of bed don’t even include one, but even if yours does, you don’t need to use it. Like the headboard, there are many alternatives to traditional footboards, but if your bedroom is small, leave the foot of the bed open. Who says you can’t have some fun in the master bedroom? No, not that kind of fun, we’re talking about decorating fun. Your bedroom is your private space, so why not decorate it in a way that makes you the happiest? Go ahead and toss a pillow shaped like your dog’s face on the bed. String some twinkle lights around the headboard or over the window treatments. Hang that painting you did yourself in a Paint ‘n’ Wine class. Paint your dresser the hottest shade of pink you can find. Whatever makes you smile. It’s not true that you need to stick with just one type of wood in a room. In fact, a contrast between the finishes on the floor and the various pieces of furniture looks great if you follow one guideline: watch the undertones. In other words, a space looks best with either all warm or all cool finishes of wood. If you have a piece that clashes, restore harmony by painting it white, black or your favorite color. Says who? A cheerfully colored ceiling is a great way to add some pizzazz to an otherwise neutral bedroom. Or use a dark color for drama. You can even paint a mural on your ceiling: fluffy white clouds on a blue sky, birds flying across the room, cherubs peering down at you à la Raphael’s, Sistine Madonna. The one time it really is best to stick with white is when your walls are a very dark color. In that case, the white opens up the space and keeps the room from feeling cave-like. While many people favor a bright accent or two to light up a neutral, white or monochromatic space, it’s certainly not a requirement. In fact, many other people appreciate the soothing calm of a bedroom that does nothing to jar the eyes or stimulate the senses. If you fall into the latter camp, there are other ways to add interest and contrast beyond the use of color. Texture is one such way; be sure to incorporate plenty of varied textures throughout the room: a faux fur area rug, nubby knit throw blanket, rustic wood furniture, shiny mirrored nightstand. Another way to create contrast without the use of bright color is through a mix of patterns. Stick with a subdued palette, but vary the patterns on your throw pillows, bedding, window treatments, and other accessories throughout the room. Is Cork Flooring Right for Your Bedroom? What Are the Differences Between Curtains, Drapes, Shades, and Blinds? Start Today, and In Two Weeks You'll Be Sleeping Better Every Night!